Camus was an undergraduate intern who majored in American Studies as well as Russian, Eastern European, and Eurasian Studies. Her research interests included childhood, war propaganda, and 20th century literary relationships between Russia and the United States. Food was in high demand during the First World War, especially in Russia. The food shortages were so constant that they were ultimately one of the factors that helped to incite the revolutions of 1917. Although seemingly minor compared to the famine Eastern Europe would later experience under Stalin, food shortages were instrumental in harvesting a deep resentment toward the tsar and general war weariness. For everyday citizens, getting food in cities was a full-time job. It required spending long hours in line only to be rewarded with slim rations—and sometimes nothing at all. It would make sense to assume that all the food was going to soldiers at the front. However, by 1915, only a year into the war, the Russian Army was also suffering from the food shortage. The Russian economy simply wasn’t equipped both to fight a war and feed its citizens. Young men left the countryside in droves after being conscripted into the army, severely cutting the available labor force and slowing agricultural production. Inflation as a result of the war then made it impossible for the remaining farmers to make a profit on their goods. No one could afford to grow food, and few could afford to buy enough of it. 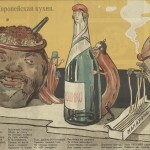 Food then became a prominent subject in Russian propaganda. The Harry Ransom Center is home to the diverse collection of Kuharet’s Russian World War I posters. A surprising number of these prints pertain to food: specifically food that has been personified as evil. Even the act of eating food is portrayed as unpleasant—something that would likely have been incomprehensible to the starving nation. Staples such as onions and potatoes morph into crude caricatures of Franz Josef, Wilhelm, and his sons, insisting that the evil of the Germans could only have grown in the garden of the devil himself. 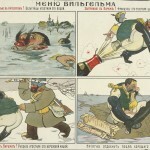 Another poster titled “Wilhelm’s Menu” replaces the expected food on the menu with violent actions against Wilhelm: showing him drowning, beaten, and left broken and alone. Posters such as these served to create negative connotations between food and eating. Food was also strangely tied to nationalism, specifically in a series of posters titled “European Cuisine.” In this set, countries involved in the war are all personified as food: Germany and Austro-Hungary are both portrayed as conniving sausages, while Russia is equated to a hearty bowl of kasha (the Russian equivalent of porridge). While the sausages try in vain to consume the other “countries,” the kasha spills forth to overtake them. This poster is on view in the Ransom Center’s current exhibition The World at War, 1914–1918. The Russian kasha is made up of figures of soldiers—the only human characters on the poster. Even in posters real Russian food was lacking. Food and the experience of eating were both portrayed as dangerous, violent, and unpleasant in a futile effort to make the starving Russian population forget the normalcy associated with these actions. The Ransom Center’s collection of World War I-era propaganda posters have been digitized as part of the digital collections. European Cuisine is the first poster in the series that details the start of the war between the German and Austrian sausages and the Russian porridge and the concerns of the other foods (countries). European Cuisine (Second Course). 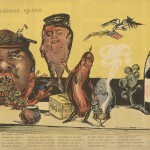 The second poster in the series illustrates the definitive victory of the Russian porridge over the Austrian sausages with the support of the English beefsteak and an American eagle. How the Devil grew his garden. 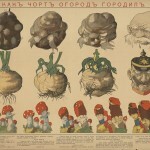 A poster showing the Kaiser and his sons growing out of various vegetables. Wilhelm’s Menu. 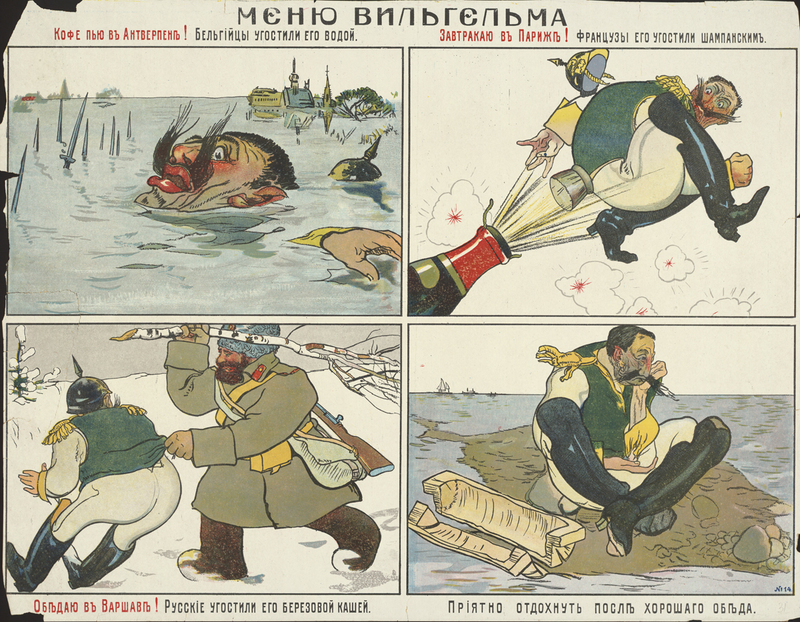 A four-panel cartoon depicting the Kaiser being defeated at breakfast, lunch, and dinner before being forced to sit in defeat.